Haven’t we seen and heard of people lying, overstating expenses when they went on a business trip, taking credit for others’ work, badmouthing colleagues and others? Stealing, taking shortcuts to work, shouting at others, passing sarcastic comments, being extravagant with actions and words are commonplace in many organizations. 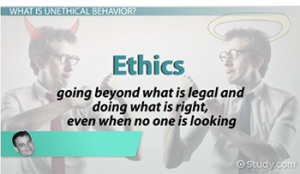 Many of us might not consider all of these as violations of ethics. Over a period of time, we see in many organizations, the behaviours and actions of the leaders are way different from what it espouses. How do we make sure that our workplace reflects all that we project in our corporate presentations and external communication material? We know about allegations of corruption in Nissan and several money laundering cases that keep raising their ugly heads once in a while. We had the MeToo movement that rocked the world across all walks of life. All of these are easy to classify as unethical. Well-established organizations have defined processes to deal with such cases of violation. What happens when a large contract can be won with some quid pro quo with a decision-maker? Let us say, the top performer in the team has been found lying on several occasions. Do we treat this with a reprimand or violation of ethics code? What do we do when one of the senor-most leaders in the organization has been found indulging in favouritism? These are situations involving high stakes. One needs a huge moral courage to prioritise the means over the ends. Very often, people tend to side with outcomes than with the process. We need both of them and call a spade a spade! We know, senior leaders are powerful and they can pull a few strings within the organization as well as outside. People think, “Why should I burn bridges with the person even if he or she seems to have erred sometimes. May be, someone else will tell him or her about the transgressions! Why should I stick my neck out? May be, it is my own insecurity or lack of understanding! May be, others do not see this as a problem; may be, it’s my over-reaction!” People with authority and power could intimidate others. Organizations and their top leaders have to build a culture in the company by which all employees including the CEO are accountable for their actions and behaviours. There need to be enough checks and balances so that leadership behaviours are subject to scrutiny by peers and subordinates. Progressive organizations benchmark their performance on metrics like attrition rate, employee satisfaction and glassdoor scores against their industry peers. Leaders need to be aware that they could be bending some rules and committing several lapses due to the fact that they are in a position of invincibility in their organization, sometimes are treated as celebrities and get used to certain entitlements. So, they need to proactively engage with people who they trust for honest feedback, listen to their voices, look for the flaws and take care to not trudge into the muddy waters. Human beings have a need to belong to the larger group. They soak in the behaviours of the leader and the influencers in the group. Choice of words, demeanours and norms followed in the group become a part of life at work. We observe how tough situations are addressed in the group. An organization might identify dignity and results-orientation as core values. We observe closely the behaviours of the leaders in the group dealing with the one who is unable to deliver the results. In several situations, the person gets publicly shamed and disrespected. Does the leader take care to ensure that the person’s dignity is not compromised and at the same time, underperformance is analysed and actions are urged with a sense of fervour? Behaviours of leaders are closely watched and followed. They might lose the way little by little over a period of time without their cognizance. Over a period of time, the culture might have emerged into something which is way different from what they intended to. Since everyone in their team fit into the way of life at work, nobody can see the gradual shift taking place on the ground. It is important that the organization uses an external help to study the climate, culture and the direction it is taking over a period of time. The moral compass of the leaders has to be put back on the right path. They need to proactively invite others to show them the mirror and take actions based on what they hear.